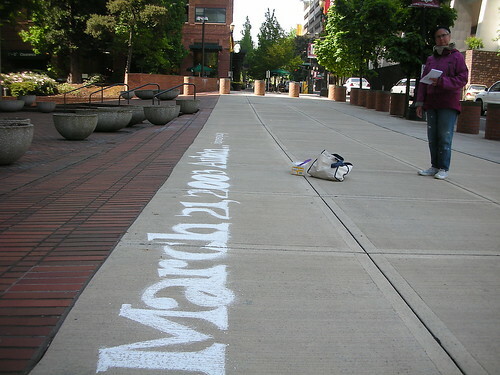 Memorial Day weekend Nancy will rewalk the Iraq Names Project Route. 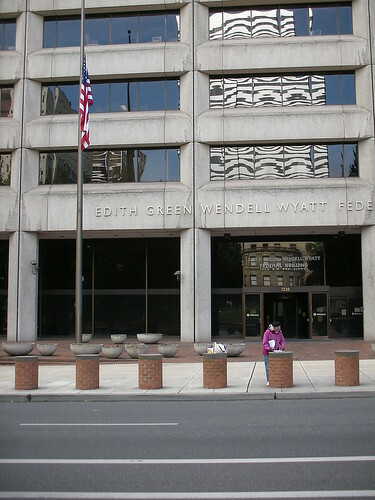 Starting Saturday May 24th, 10am at the Edith Green Wendell Wyatt Federal Building (SW 3rd & SW Jefferson). 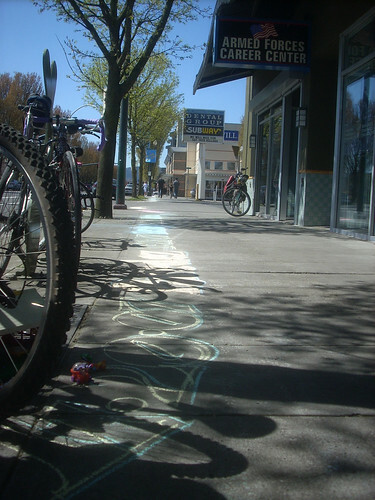 Saturday we will walk the route Nancy chalked last year to Irving Park. Sunday May 25th at 10am we will walk from Irving Park (NE 7th & NE Freemont) to Wilshire Park. 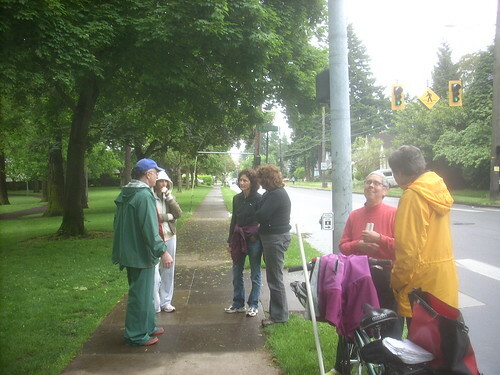 Memorial Day May 26th at 10am we will walk from Wilshire Park (NE 33rd & NE Skidmore) to Holladay Park (NE Multnomah & NE 11th). 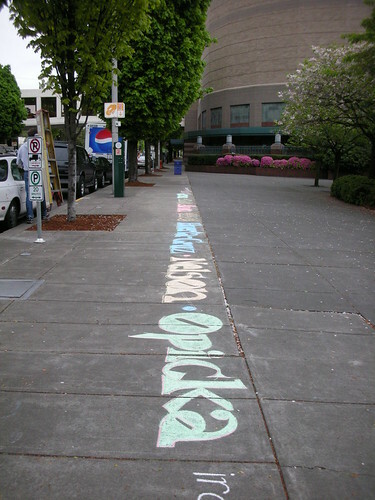 When we get to Holladay Park Nancy will start chalking again. On Saturday and Sunday we will have a little potluck picnic when we finish walking. Please join us any time. You can contact dan.namesproject at gmail for more information. The 4,385th coalition soldier to die in Iraq and the most recent name released by the Department Of Defense, as of May 10th. Aaron was 19 years old when he died, he was from San Jacinto CA and stationed out of Fort Lewis. 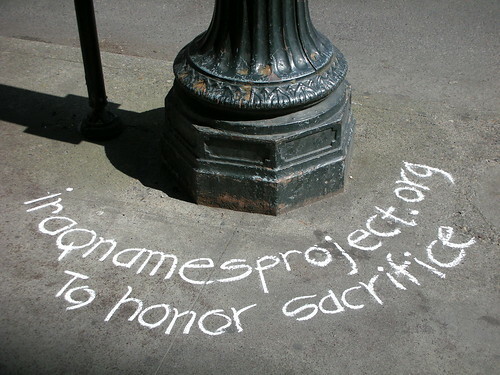 347 days ago Nancy Hiss started writing the names of Coalition soldiers who died in Iraq. 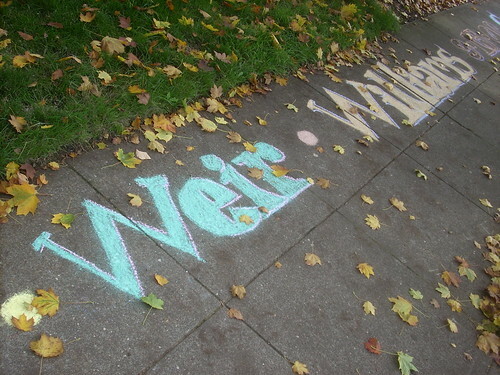 She draws them in chalk on the city sidewalks of Portland. 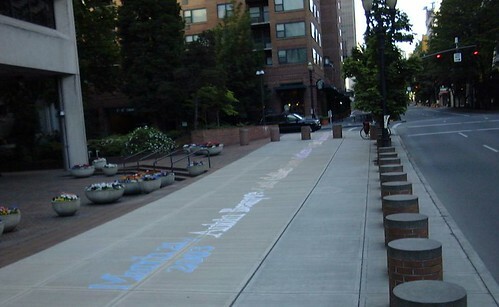 She has drawn a continuous line 12 miles long starting with those who died on March 21st 2003. Now she has no names to write. No doubt more will die, 2 already have but the names have not been released. She now has the sad job of waiting for the Department of Defense to announce the names of those who have died. 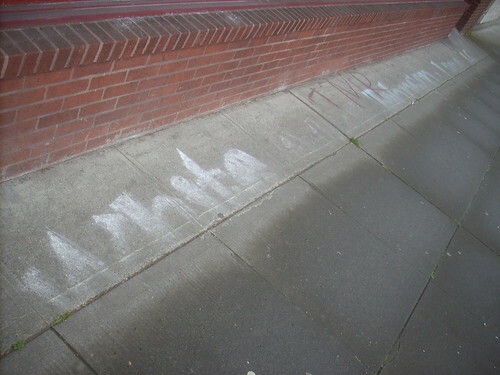 When she gets more names she will be back on the sidewalk. You can see or join Nancy while she continues draw the names of those who have died. 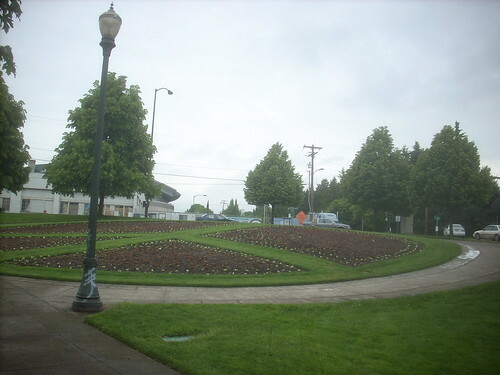 She is currently on NE 9th, by Nordstrom Lloyd Center heading toward Holladay Park and 12th Ave and Benson High School. 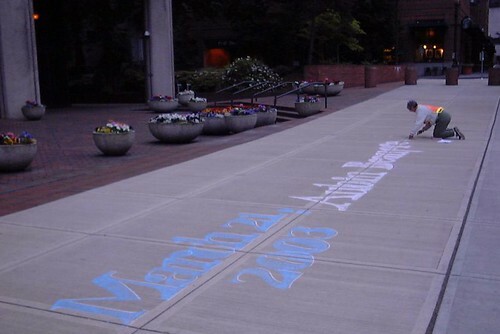 Nordstrom has a nasty habit of washing the names off the sidewalk after Nancy leaves. So finding her can be a little tricky. Nancy Hiss has worked in 100+ degree heat and freezing temperature and snow and rain. 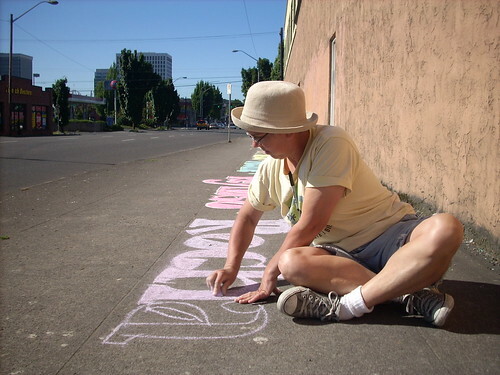 Since last Memorial Day she has covered 12 miles of Portland city sidewalks and drawn more than 4,348 names of coalition forces who have died in Iraq. The first Anniversary will be Monday May 26th. Soon she will catch up with real time. Nancy has been drawing the names in order of the day they died. On May 8th she wrote the name Brosh. Benjamin K. Brosh died March 18th 2008. Soon she will be finding the names of those who died the day before and going out and remembering them. Soon she will cross E Burnside and be in SE Portland. 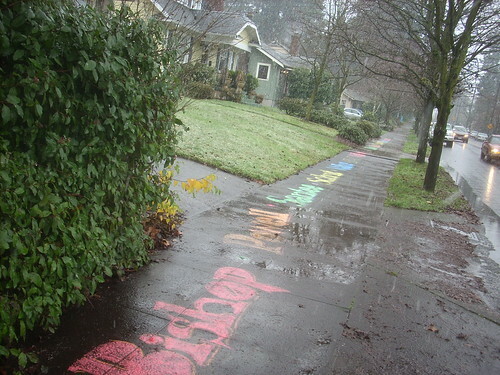 She has already covered sidewalks in SW, NW, N and NE Portland. You can see a map of where the Iraq Names Project has been here. You can see photos here. Nancy’s thumbs hurt. She is tired, tired of getting up early to chalk, tired of people dying, tired of Nordstrom washing away her work, tired of people not caring. Still she gets up and goes out and chalks most every morning. Some recognition is starting to come her way. She has presented a slide show of the Iraq Names Project at Grant High School and the annual IDEC conference in Montreal. Thursday May 15th she will give an artist talk at Art Beat, on the PCC Sylvania campus at 2pm, Little Theater. 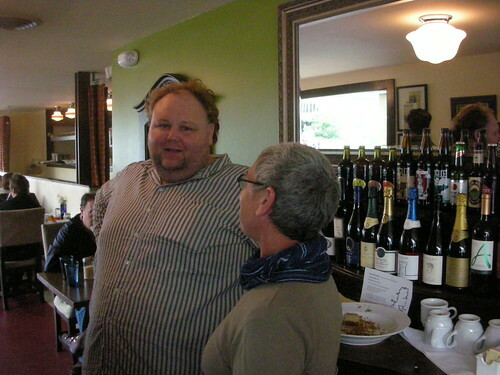 Friday May 9th Nancy will present the project at a Marylhurst faculty tea. Noon in the Old Library. 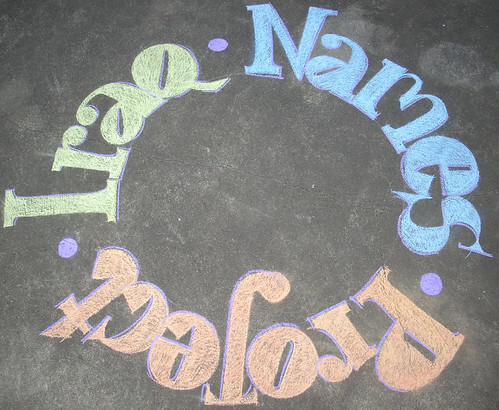 If you would like Nancy to present the Iraq Names Project you contact me dan.namesproject at gmail. You are currently browsing the Iraq Names Project blog archives for May, 2008.